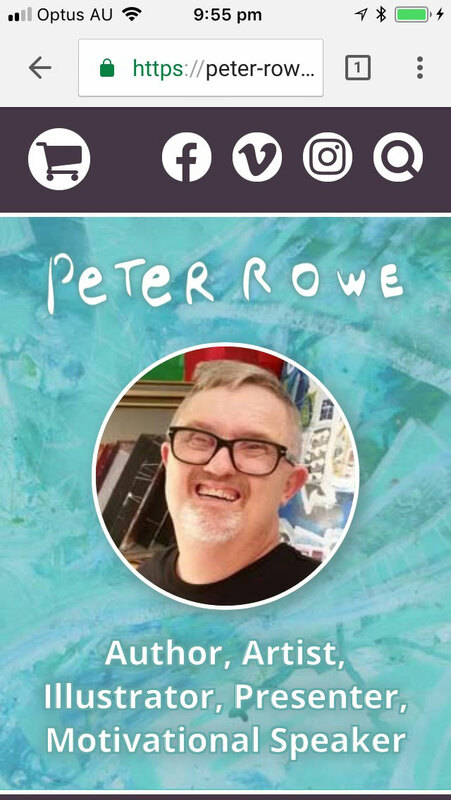 Peter Rowe is an Author, Illustrator, Artist, Presenter and Motivational Speaker, and yes he also just happens to have Down syndrome. He is not ashamed of having Down syndrome, nor does he feel limited or defined by this; in fact, he thinks it is very important to embrace who you are and what makes you different. When I think about the statement "the right person for the right job" I think how absolutely perfect Min Dean from Equivalent Exchange was for creating a new website for Peter Rowe. Min had a fantastic level of understanding and awareness around the unique needs and outcomes required for Peter. I personally worked with Min and Peter to ensure that Peter's vision for his website were realised and was so impressed and appreciative of the assistance and support Min offered. Min took on board the importance of creating a website that captured and reflected Peter, his story and the message he wished to share. It is clear that Min is passionate about taking her clients visions and turning them into a reality. The level of support both during and after the website development was exceptional and we would not hesitate in recommending Min and equivalent exchange to anyone wising to have a website created that reflects exactly who they are. Peter and his team approached me to integrate a shop into their existing website, but soon after we started working together we decided that a redesign would be worth pursuing, to align to some branding wishes/changes they were making. 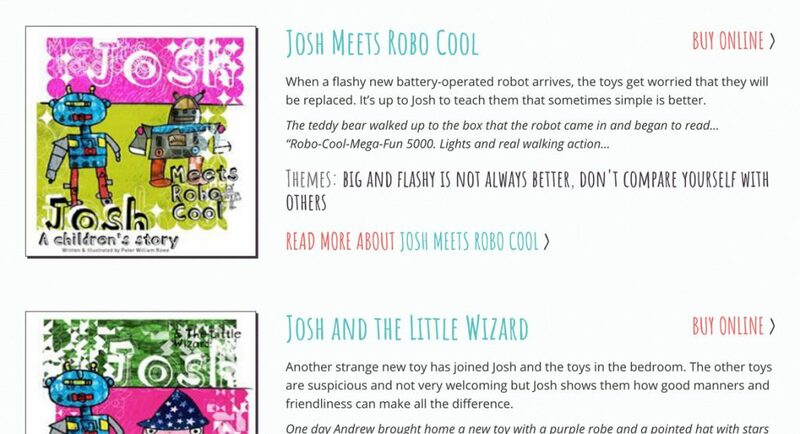 His old site was in WordPress, so of course we stuck with WordPress for the redevelopment, though the entire site was begun from scratch so that it would be as neat and fast as possible. Tracey, on of Peter’s facilitators, took it upon herself to learn how to use Peter’s site inside and out, and asked as many questions as needed during the staging process – which I loved, as it ensured that the client was happy and confident in using the website before it went live. 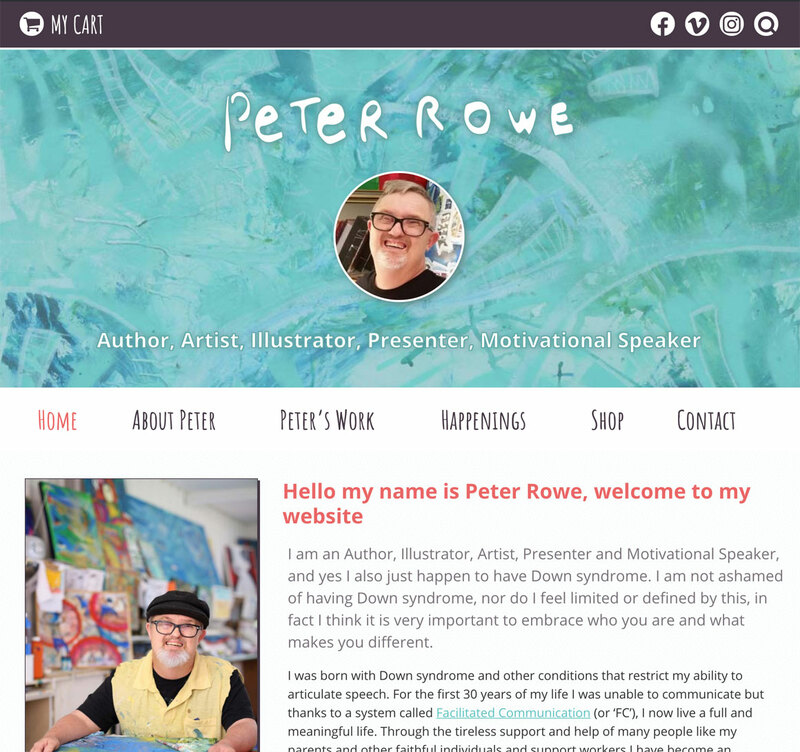 Peter needed a nice way to display all of the types of works that he does; a gallery for artwork, a dynamic way to list the books he has written and illustrated and the poetry he has written, a history of his most memorable presentations, a shop through which to sell both artwork and books (both of which needed very different shipping methods incorporated), an events calendar so that users can see where Peter will be visiting next, a blog for news and to keep the site’s content dynamic, and of course information pages that detail Peter’s remarkable story. Peter has a very active social media presence, so both his Facebook page and Instagram feed were embedded into the final site, too. Design-wise he wanted something bright and engaging, yet able to walk that fine line to appeal to professionals who are seeking public speakers. During the design phase we worked back and forth on the proposed layout to ensure that the look and feel would have a personal, custom design; to me a website should be a reflection of the client’s character, so that prospective users can get a vibe for whose website they are visiting. The website has been made responsive (as all modern websites should be), so that it views beautifully on whatever device or screen its viewed on. 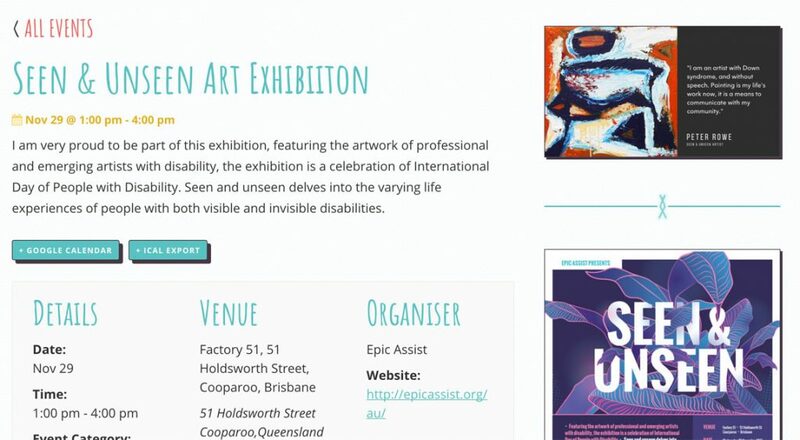 It uses Woocommerce for its shop; The Events Calendar for events management, and many custom post types for the specific types of showcases that Peter wanted to have; eg, a hand-built artist’s gallery, a custom-made books listing page, etc. For go-live, I sorted out a few new domain purchases (a .com and .com.au), redirected the original .info site, managed a hosting package purchase and set up the new email addresses that were required. After reading Peter’s story, and how he overcame incredible adversity, working on his website was one of those moments in my career that made me feel very happy about what I was doing and what I could deliver for him. I loved working on the site, on tweaking it to be the best it possibly could be, and I hope to continue working with Peter and his facilitators for many years to come. Homepage. Client can edit all of the content, images, menus; everything. Dynamic "Happenings" section including latest events, blog posts, and live Facebook page feed. Instagram is one of the main ways Peter communicates with his fans; a live Instagram feed appears at the bottom of every page. Peter's books and a selection of his art is available for sale in the online shop. 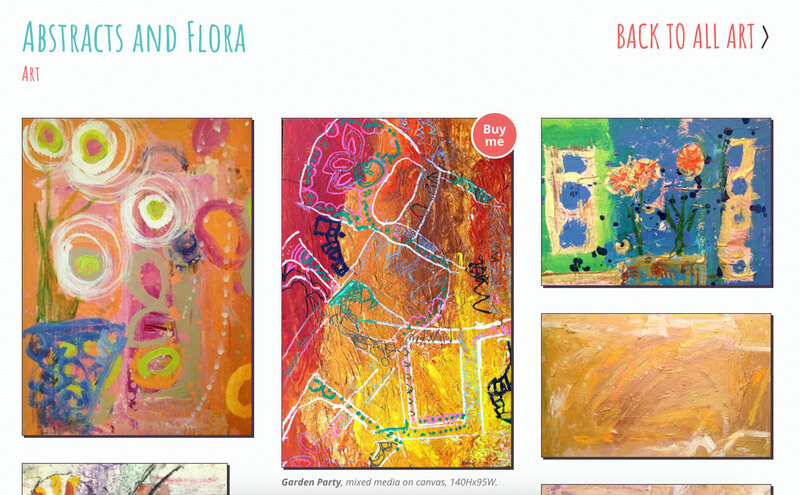 A custom art gallery was created to suit Peter's specific needs. 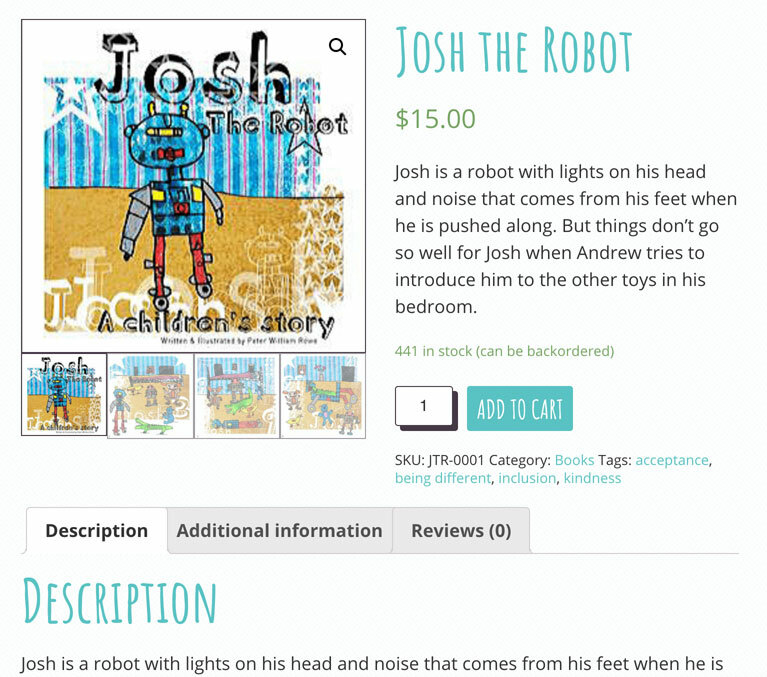 A customised books section was created to make it easy for the client to manage books and also make it look great on the front-end. 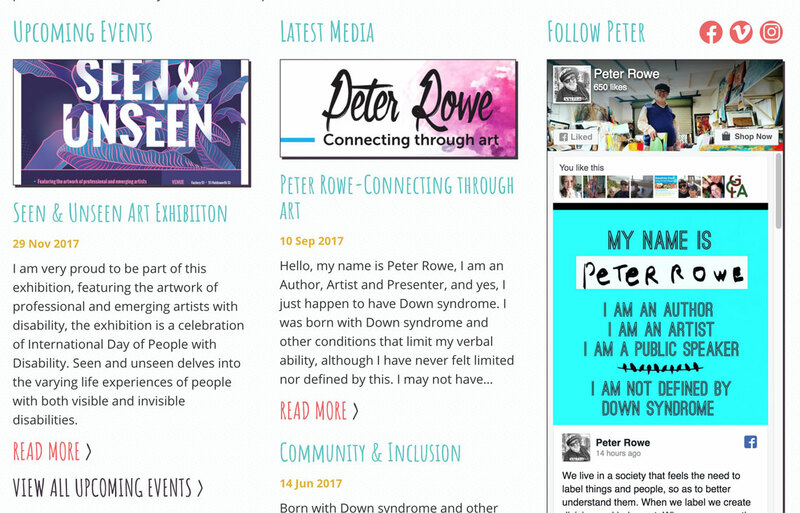 Peter's upcoming events are managed through the website. Fully responsive; view from a handheld device.